The picture also features Mary Philbin, Norman Kerry, Arthur Edmund Carewe, Gibson Gowland, John St. Polis and Snitz Edwards. The last surviving cast member was Carla Laemmle (1909–2014), niece of producer Carl Laemmle, who played a small role as a "prima ballerina" in the film when she was about 15. Based on the general release version of 1925, which has additional scenes and sequences in different order than the existing reissue print. The film opens with the debut of the new season at the Paris Opera House, with a production of Gounod's Faust. Comte Philippe de Chagny (John St. Polis) and his brother, the Vicomte Raoul de Chagny (Norman Kerry) are in attendance. Raoul attends only in the hope of hearing his sweetheart Christine Daaé (Mary Philbin) sing. Christine has made a sudden rise from the chorus to understudy of Mme. Carlotta, the prima donna. Raoul visits her in her dressing room during the performance, and makes his intentions known that he wishes for Christine to resign and marry him. Christine refuses to let their relationship get in the way of her career. After the performance, the ballerinas are disturbed by the sight of a mysterious man in a fez (Arthur Edmund Carewe), who dwells in the cellars. Arguing whether or not he is the Phantom, they decide to ask Joseph Buquet, a stagehand who has actually seen the ghost's face. Buquet describes a ghastly sight of a living skeleton to the girls, who are then startled by a shadow cast on the wall. The antics of stagehand Florine Papillon (Snitz Edwards) do not amuse Joseph's brother, Simon (Gibson Gowland), who chases him off. Meanwhile, Mme. Carlotta (Virginia Pearson), the prima donna of the Paris Grand Opera, barges into the managers' office enraged. She has received a letter from "The Phantom," demanding that Christine sing the role of Marguerite the following night, threatening dire consequences if his demands are not met. Christine is in her dressing room at that moment, speaking to a phantom voice (which the audience sees as a shadow on a wall behind the dressing room.) The voice warns her that she will take Carlotta's place on Wednesday and that she is to think only of her career and her master. Wednesday evening, Carlotta is ill and Christine takes her place in the opera. During the performance, the managers go to Box 5 to see exactly who has taken it. The keeper of the box does not know who it is, as she has never seen his face. The two managers enter the box and are startled to see a shadowy figure seated there. They run out of the box and compose themselves, but when they enter the box again, the person is gone. In her next performance, Christine reaches her triumph during the finale and receives a standing ovation from the audience. When Raoul visits her in her dressing room, she pretends not to recognize him, because unbeknownst to those in the room, the phantom voice is present. Meanwhile, Simon Buquet finds the body of his brother, Joseph, hanging by the strangler's noose and vows vengeance. Raoul spends the evening outside her door, and after the others have left, just as he is about to enter, he hears the voice within the room. He overhears the voice make his intentions to Christine: "Soon, Christine, this spirit will take form and will demand your love!" When Christine leaves her room alone, Raoul breaks in to find it empty. Carlotta receives another discordant note from the Phantom. Once again, it demands that she take ill and let Christine have her part. The managers also get a note, reiterating that if Christine does not sing, they will present "Faust" in a house with a curse on it. The following evening, despite the Phantom's warnings, a defiant Carlotta appears as Marguerite. At first, the performance goes well, but soon the Phantom's curse takes its effect, backstage, causing the great crystal chandelier to fall down onto the audience. Christine runs to her dressing room and is entranced by a mysterious voice through a secret door behind the mirror, descending, in a dream-like sequence, semi-conscious on horseback by a winding staircase into the lower depths of the Opera. She is then taken by gondola over a subterranean lake by the masked Phantom into his lair. The Phantom introduces himself as Erik and declares his love; Christine faints, so Erik carries her to a suite fabricated for her comfort. The next day, when she awakens, she finds a note from Erik telling her that she is free to come and go as she pleases, but that she must never look behind his mask. In the next room, the Phantom is playing his composition, "Don Juan Triumphant." Christine's curiosity gets the better of her, and she sneaks up behind the Phantom and tears off his mask, revealing his hideously deformed face. Enraged, the Phantom makes his plans to hold her prisoner known. In an attempt to plead to him, he excuses her to visit her world one last time, with the condition that she never sees her lover again. Released from the underground dungeon, Christine makes a rendezvous at the annual masked-ball, which is graced with the Phantom in the guise of the 'Red-Death' from the Edgar Allan Poe short story of the same name. Raoul finds Christine and they flee to the roof of the Opera House, where she tells him everything that followed the chandelier crash. However, an unseen jealous Phantom perching on the statue of Apollo overhears them. Raoul plans to whisk Christine safely away to London following the next performance. As they leave the roof, the mysterious man with the fez approaches them. Aware that the Phantom is waiting downstairs, he leads Christine and Raoul to another exit. The following evening, Raoul meets Christine in her dressing room. She has heard the voice of the Phantom, who has revealed that he knows their plans. Raoul has arranged for a carriage and reassures her nothing will go wrong. During the performance, the Phantom kidnaps Christine off the stage during a blackout. Raoul rushes to Christine's dressing room, and meets the man in the fez, who reveals himself to be Inspector Ledoux, a secret policeman who has been studying Erik's moves as the Phantom since he escaped as a prisoner from Devil's Island. Ledoux reveals the secret door in Christine's room and the two men enter the catacombs of the Opera House in an attempt to rescue Christine. Instead, they fall into the Phantom's dungeon, a torture room of his design. Philippe has also found his way into the catacombs looking for his brother, and a clanging alarm alerts the Phantom to his presence in a canoe on the lake. Phillipe is drowned by Erik, who returns to find the two men in the torture chamber. Turning a switch, the Phantom subjects the two prisoners to intense heat; the two manage to escape the chamber by opening a door in the floor as they are about to perish. In the chamber below, the Phantom shuts a gate, locking them in with barrels full of gunpowder. The Phantom gives Christine a choice of two levers: one shaped like a scorpion and the other like a grasshopper. One of them will save Raoul's life, but at the cost of Christine marrying Erik, while the other will blow up the barrels in the chamber Raoul and Ledoux are trapped in, in effect destroying the Opera House and killing them all. Christine picks the scorpion, but it is a trick by the Phantom to "save" Raoul and Ledoux from being killed by drowning them. Christine begs the Phantom to save Raoul, promising him anything in return, even becoming his wife. At the last second, the Phantom opens a trapdoor in his floor through which Raoul and Ledoux are saved. A mob, led by Simon, infiltrates the Phantom's lair. As the clanging alarm sounds and the mob approaches, the Phantom attempts to flee with Christine in the carriage meant for Raoul and Christine. While Raoul saves Christine, the Phantom is pursued and killed by a mob, who throw him into the River Seine to finally drown. In a brief epilogue, Raoul and Christine are shown on their honeymoon in Viroflay. In 1922, Carl Laemmle, the president of Universal Pictures, took a vacation to Paris. During his vacation Laemmle met the author Gaston Leroux, who was working in the French film industry. Laemmle mentioned to Leroux that he admired the Paris Opera House. Leroux gave Laemmle a copy of his 1910 novel The Phantom of the Opera. Laemmle read the book in one night and bought the film rights as a vehicle for actor Lon Chaney, Sr.. Production started in late 1924 at Universal Studios. French artist, Ben Caray, whom had worked at the Paris Opera House, was brought in to design the backstage and cellars which Universal could not replicate; and although his English limited, Caray was able to speak clearly with his charcoal drawings depicting the descent into the Opera which Universal replicated exactly. Production did not go smoothly; according to director of photography, Charles Van Enger, throughout production, Chaney and the rest of the cast and crew had strained relations with director Rupert Julian. The tension got particularly hostile between Chaney and Julian that Van Enger would serve as the go-between and report to Chaney of Julian's directions to which the actor would simply remark the director to go and "screw himself!" Chaney ultimately directed much of his own scenes. The first cut of the film was previewed in Los Angeles on January 7 and 26, 1925. The score was prepared by Joseph Carl Breil. No information about the score survives other than Universal's release: "Presented with augmented concert orchestra, playing the score composed by J. Carl Briel, composer of music for Birth of a Nation". The exact quote from the opening day full-page ad in the Call-Bulletin read: "Universal Weekly claimed a 60-piece orchestra. Moving Picture World reported that "The music from Faust supplied the music [for the picture]." Due to poor reviews and reactions, the January release was canceled. On advice from Chaney and others, Universal told Julian to re-shoot most of the picture and change its style, as it was feared that a Gothic melodrama would not recoup the film's massive budget. Julian eventually walked out. Edward Sedgwick (later the director of Buster Keaton's 1928 film The Cameraman) was then assigned by producer Laemmle to direct a reshoot of the bulk of the film. Raymond L. Schrock and original screenwriter Elliot Clawson wrote new scenes at the request of Sedgewick. The film was then changed from the dramatic thriller that was originally made into more of a romantic comedy with action elements. Most of the new scenes depicted added subplots, with Chester Conklin and Vola Vale as comedic relief to the heroes, and Ward Crane as the Russian Count Ruboff dueling with Raoul for Christine's affection. This version was previewed in San Francisco on April 26, 1925, and did not do well at all, with the audience booing it off of the screen. "The story drags to the point of nauseam", one reviewer stated. Following the success of The Hunchback of Notre Dame in 1923, Chaney was once again given the freedom to create his own makeup, a practice which became almost as famous as the films he starred in. Chaney painted his eye sockets black, giving a skull-like impression to them. He also pulled the tip of his nose up and pinned it in place with wire, enlarged his nostrils with black paint, and put a set of jagged false teeth into his mouth to complete the ghastly, deformed look of the Phantom. When audiences first saw The Phantom of the Opera, they were said to have screamed or fainted during the scene where Christine pulls the concealing mask away, revealing his skull-like features to the audience. 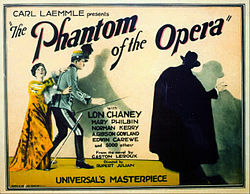 Chaney's appearance as the Phantom in the film has been the most accurate depiction of the title character based on the description given in the novel, where the Phantom is described as having a skull-like face with a few wisps of black hair on top of his head. 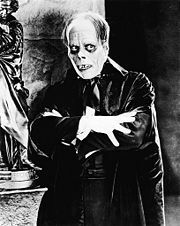 As in the novel, Chaney's Phantom has been deformed since birth, rather than having been disfigured by acid or fire, as in later adaptations of The Phantom of the Opera. Producer Laemmle commissioned the construction of a set of the Paris Opera House. Because it would have to support thousands of extras, the set became the first to be created with steel girders set in concrete. For this reason it was not dismantled until 2014. Stage 28 on the Universal Studios lot still contained portions of the opera house set, and was the world's oldest surviving structure built specifically for a movie, at the time of its demolition. It was used in hundreds of movies and television series. In preparation for the demolition of Stage 28, the Paris Opera House set went through a preservation effort and was placed into storage. Stage 28 was completely demolished on September 23, 2014. Initial critical response for the film was mixed. Mordaunt Hall of The New York Times gave the film a positive review as a spectacle picture, but felt that the story and acting may have been slightly improved. TIME praised the sets but felt the picture was "only pretty good". Variety wrote, "The Phantom of the Opera is not a bad film from a technical viewpoint, but revolving around the terrifying of all inmates of the Grand Opera House in Paris by a criminally insane mind behind a hideous face, the combination makes a welsh rarebit look foolish as a sleep destroyer." Modern critical response for the film has been more positive, with many considering it the best adaption of Leroux's novel. Roger Ebert awarded the film four out of four stars, writing "It creates beneath the opera one of the most grotesque places in the cinema, and Chaney's performance transforms an absurd character into a haunting one." Adrian Warren of PopMatters gave the film 8/10 stars, summarizing, "Overall, The Phantom of the Opera is terrific: unsettling, beautifully shot and imbued with a dense and shadowy Gothic atmosphere. With such a strong technical and visual grounding it would have been difficult for Chaney to totally muck things up, and his performance is indeed integral, elevating an already solid horror drama into the realms of legendary cinema." Time Out London gave the film a mostly positive review, criticizing the film's "hobbling exposition", but praised Chaney's performance as being the best version of the title character, as well as the film's climax. TV Guide gave the film 4/5 stars, stating, "One of the most famous horror movies of all time, The Phantom of the Opera still manages to frighten after more than 60 years." On Rotten Tomatoes, The Phantom of the Opera holds an approval rating of 91% based on 46 reviews, with a weighted average rating of 8.4/10. The site's critical consensus reads, " Decades later, it still retains its ability to scare -- and Lon Chaney's performance remains one of the benchmarks of the horror genre." 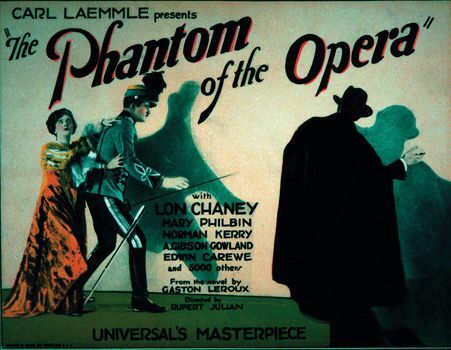 After the successful introduction of sound pictures during the 1928–29 movie season, Universal announced that they had secured the rights to a sequel to The Phantom of the Opera from the Gaston Leroux estate. Entitled The Return of the Phantom, the picture would have sound and be in color. Universal could not use Chaney in the film as he was now under contract at MGM. Universal later scrapped the sequel, and instead opted to reissue The Phantom of the Opera with a new synchronized score and effects track, as well as new dialog sequences. Directors Ernst Laemmle and Frank McCormick reshot a little less than half of the picture with sound during August 1929. The footage reused from the original film was scored with music arranged by Joseph Cherniavsky, and sound effects. Mary Philbin and Norman Kerry reprised their roles for the sound reshoot, and Edward Martindel, George B. Williams, Phillips Smalley, Ray Holderness, and Edward Davis were added to the cast to replace actors who were unavailable. Universal was contractually unable to loop Chaney's dialogue, but voiceovers by the Phantom were looped over shots of his shadow. (The voiceovers are uncredited, but were probably done by Phillips Smalley.) Because Chaney's talkie debut was eagerly anticipated by filmgoers, advertisements emphasized, "Lon Chaney's portrayal is a silent one!" The sound version of Phantom opened on February 16, 1930, and grossed another million dollars. This version of the film is lost, although the soundtrack discs survive. The success of The Phantom of the Opera inspired Universal to finance the production of a long string of horror films such as Dracula, Frankenstein, The Wolf Man, The Invisible Man, and The Mummy, as well as numerous sequels to all five movies. Many of the films are now considered studio classics. Although this particular adaptation is often considered the most faithful, it contains some significant plot differences from the original novel. In the movie, M. Debienne and M. Poligny transfer ownership of the opera to M. Montcharmin and M. Richard, while in the novel they are simply the old and new managers. The character of Ledoux is not a mysterious Persian and is no longer a onetime acquaintance of the Phantom. He is now a French detective of the Secret Police. This character change was not originally scripted; it was made during the title card editing process. The Phantom has no longer studied in Persia in his past. Rather, he is an escapee from Devil's Island and an expert in "the Black Arts". The filmmakers initially intended to preserve the original ending of the novel, and filmed scenes in which the Phantom dies of a broken heart at his organ after Christine leaves his lair. There was also a short scene showing Christine and Raoul on a honeymoon. Because of the preview audience's poor reaction, the studio decided to change the ending to a more exciting one. Utility director Edward Sedgwick was hired to provide a climactic chase scene, with an ending in which the Phantom, after having saved Ledoux and Raoul, kidnaps Christine in Raoul's carriage. He is hunted down and cornered by an angry mob, who beat him to death and throw him into the Seine. The unmasking scene which was said to have made theater patrons scream and faint in 1925. The Eastman House version is on the left, the original 1925 version on the right. The finest quality print of the film existing was struck from an original camera negative for George Eastman House in the early 1950s by Universal Pictures. The original 1925 version survives only in 16mm "Show-At-Home" prints created by Universal for home movie use in the 1930s. There are several versions of these prints, but none is complete. All are from the original domestic camera negative. Because of the better quality of the Eastman House print, many home video releases have opted to use it as the basis of their transfers. This version has singer Mary Fabian in the role of Carlotta. 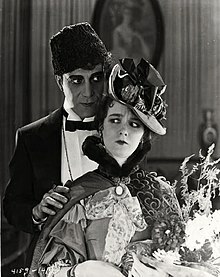 In the reedited version, Virginia Pearson, who played Carlotta in the 1925 film, is credited and referred to as "Carlotta's Mother" instead. Most of the silent footage in the 1930 version is actually from a second camera, used to photograph the film for foreign markets and second negatives; careful examination of the two versions shows similar shots are slightly askew in composition in the 1930 version. In 2009, ReelClassicDVD issued a special edition multi-disc DVD set which included a matched shot side-by-side comparison of the two versions, editing the 1925 Show-At-Home print's narrative and continuity to match the Eastman House print. For the 2003 Image Entertainment–Photoplay Productions two-disc DVD set, the 1930 soundtrack was reedited in an attempt to fit the Eastman House print as best as possible. However, there are some problems with this attempt. There is no corresponding "man with lantern" sequence on the sound discs. While the "music and effect" reels without dialogue seem to follow the discs fairly closely, the scenes with dialogue (which at one point constituted about 60% of the film) are generally shorter than their corresponding sequences on the discs. Also, since the sound discs were synchronized with a projection speed of 24 frames per second (the established speed for sound film), and the film on the DVD is presented at a slower frame rate (to reproduce natural speed), the soundtrack on the DVD set has been altered to run more slowly than the originally recorded speed. A trailer for the sound reissue, included for the first time on the DVD set, runs at the faster sound film speed, with the audio at the correct pitch. On November 1, 2011, Image Entertainment released a new Blu-ray version of Phantom, produced by Film Preservation Associates, the film preservation company owned by David Shepard. On January 10, 2012, Shadowland Productions released The Phantom of the Opera: Angel of Music Edition, a two-disc DVD set featuring a newly recorded dialogue track with sound effects and an original musical score. The film was also reedited, combining elements from the 1925 version with the 1929 sound release. A 3D anaglyph version is included as an additional special feature. It is uncertain for what purpose the negative used to strike the Eastman House print was produced, as it includes footage from the 1930 sound reissue, and shows few signs of wear or damage. For unknown reasons, an opening prologue showing a man with a lantern has been added—using a single continuous take—but no corresponding title cards or dialogue survive. This shot seems to have been a talking sequence, but it shows up in the original 1925 version, shorter in duration and using a different, close-up shot of the man with the lantern. Furthermore, the opening title sequence, the lantern man, the footage of Mary Fabian performing as Carlotta, and Mary Philbin's opera performances are photographed at 24 frames per second (sound film speed), and therefore were shot after the movie's original release. It is possible that the lantern man is meant to be Joseph Buquet, but the brief remaining close-up footage of this man from the 1925 version does not appear to be of Bernard Siegel, who plays Buquet. The man who appears in the reshot footage could be a different actor as well, but since there is no close-up of the man in this version, and the atmospheric lighting partially obscures his face, it is difficult to be certain. It is an international sound version for foreign markets. It is a negative made for Universal Studios' reference. Two comparative frames of narrative titles from the 1930 sound reissue. The title on the left is from the Technicolor sequence, which survives in 35mm. On the right, a lost title card from a 16mm print-down, not sourced from the Eastman House version. "International sound versions" were sometimes made of films which the producing companies judged not to be worth the expense of reshooting in a foreign language. These versions were meant to cash in on the talkie craze; by 1930 anything with sound did well at the box office, while silent films were largely ignored by the public. International sound versions were basically part-talkies, and were largely silent except for musical sequences. Since the films included synchronized music and sound effect tracks, they could be advertised as sound pictures, and therefore capitalize on the talkie craze in foreign markets without the expense of reshooting scenes with dialogue in foreign languages. To make an international version, the studio would simply replace any spoken dialogue in the film with music, and splice in some title cards in the appropriate language. Singing sequences were left intact, as well as any sound sequences without dialogue. The surviving sound discs of The Phantom of the Opera belong to the domestic release, but do not synchronize with the dialogue portions of the film, which have been abbreviated on the Eastman House print. However, there is no record of the content of the international version of The Phantom, nor even of the existence of such a version. Furthermore, for international sound versions, one negative was generally made for all of Europe, sent overseas, and not returned. Additionally, the Eastman House print shows no signs of negative wear that would be consistent with that of a negative printed for multiple countries. During the transition to sound in 1930, it was not uncommon for two versions of a picture, one silent and one sound, to play simultaneously (particularly for a movie from Universal, which kept a dual-format policy longer than most studios). One possibility is that the Eastman House print is actually a silent version of the reissued film, made for theaters not yet equipped with sound. However, according to trade journals of the time, no silent reissue was available. Harrison's Reports, which was always careful to specify whether or not a silent version of a movie was made, specifically stated that "there will be no silent version." Furthermore, by 1930, fewer exhibitors were booking completely silent films, and this had forced all of the major studios to add soundtracks and dialogue sequences to all of their major releases that had previously been intended for release as silent pictures. Studios no longer expended much time or money on silent versions, which were meant to be shown in rural areas where theaters could not yet afford the conversion to sound. Nevertheless, if the extant print is a silent version, it would explain why Universal still had it and also the lack of wear on the negative from which it was struck. 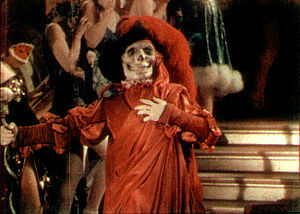 The "Bal Masqué" scene was highlighted by using the Technicolor process. According to Harrison's Reports, when the film was originally released, it contained 17 minutes of color footage; this footage was retained in the 1930 part-talking version. Technicolor's records show 497 feet of color footage. Judging from trade journals and reviews, all of the opera scenes of Faust as well as the "Bal Masqué" scene were shot in Process 2 Technicolor (a two-color system). Prizmacolor sequences were also shot for the "Soldier's Night" introduction. Only the "Bal Masqué" scene survives in color. In the scene on the rooftop of the opera, the Phantom's cape was colored red, using the Handschiegl color process. This effect has been replicated by computer colorization in the 1996 restoration by Kevin Brownlow's Photoplay Productions. As with many films of the time, black-and-white footage was tinted various colors to provide mood. These included amber for interiors, blue for night scenes, green for mysterious moods, red for fire, and yellow (sunshine) for daylight exteriors. In 1998 The Phantom of the Opera was added to the United States National Film Registry, having been deemed "culturally, historically or aesthetically significant". It was included, at #52, in Bravo's 100 Scariest Movie Moments. It is listed in the film reference book 1001 Movies You Must See Before You Die. In the United States, the film is in the public domain because Universal did not renew the copyright in 1953. ^ Harrison's Reports film review; September 17, 1925, page 151. ^ "The Phantom of the Opera (1925) - Release dates". Internet Movie Database. Amazon.com. ^ a b Preface to Forsyth, Frederick (1999). The Phantom of Manhattan. Bantam Press. ISBN 0-593-04510-6. ^ Glass, Chris (August 26, 2014). 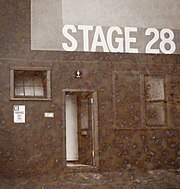 "Historic Soundstage 28 Has Been Demolished". insideuniversal.net. Archived from the original on April 1, 2016. ^ Johnson, Ted (August 28, 2014). "Universal to Demolish 'Phantom of the Opera' Soundstage, But Preserve Silent Film's Set". ^ "The Phantom of the Opera – Variety". Variety.com. Variety Staff. Retrieved 19 November 2018. ^ Ebert, Roger. "The Phantom of the Opera Movie Review (1925)". Roger Ebert.com. Roger Ebert. Retrieved 19 November 2018. ^ Warren, Adrian. "'The Phantom of the Opera' Is Unsettling and Imbued with a Dense and Shadowy Gothic Atmosphere - PopMatters". PopMatters.com. Adrian Warren. Retrieved 19 November 2018. ^ "The Phantom of the Opera, directed by Rupert Julian". TimeOut.com. TimeOut London. Retrieved 19 November 2018. ^ "The Phantom Of The Opera - Movie Reviews and Movie Ratings". TV Guide.com. TV Guide. Retrieved 19 November 2018. ^ "Possum (2018) - Rotten Tomatoes". Rotten Tomatoes.com. Flixter. Retrieved 19 November 2018. ^ "'U' to Make 'Phantom' Sequel in Sound and Color". Film Daily, May 5, 1929, Pg. 1. ^ "Chaney Not For 'U' Sequel." Film Daily, May 17, 1929, Pg. 6. ^ "'Phantom' Dialogue Scenes Are Finished By Universal." Motion Picture News, August 24, 1929, P. 724. ^ The Phantom of the Opera by Gaston Leroux, 1988 edition published by Dorset Press, New York. ^ a b "Versions and Sources of the Phantom of the Opera". blogspot.com. Nerdly Pleasures. December 31, 2013. Retrieved November 11, 2017. ^ a b "The Phantom of the Opera - Silent Era : Home Video Reviews". silentera.com. ^ Harrison's Reports film review; February 15, 1930, page 26. ^ Harrison's Reports film review; February 15, 1930, page 27. ^ "Hooray for Hollywood – Librarian Names 25 More Films to National Registry" (Press release). Library of Congress. November 16, 1998. Retrieved July 22, 2009. ^ Steven Jay Schneider (2013). 1001 Movies You Must See Before You Die. Barron's. p. 649. ISBN 978-0-7641-6613-6. 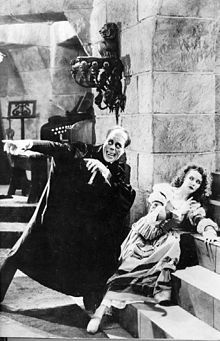 Wikimedia Commons has media related to The Phantom of the Opera (1925 film).